Help Santa find his way to your home this Christmas with a very easy-to-make Snowman Lantern. We've shown just one way of creating your snowman lantern, but it’s absolutely up to you if you want to give your lantern a different, personal touch with adding other pieces and accessories, or using other materials that you might find in your craft supplies box. Your house is much easier to spot if he just needs to follow the shining snowman, so you don't need to worry about him getting lost, even if his GPS lets him down. 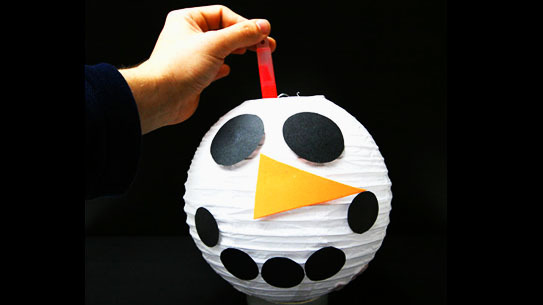 So before we start making, what will you need for a snowman lantern? The trickiest item to find on the high street will likely be a paper lantern. They're readily available on the internet, and quite affordable. They come in lots of different colours, but for a chap made out of snow, plain white is perfect. 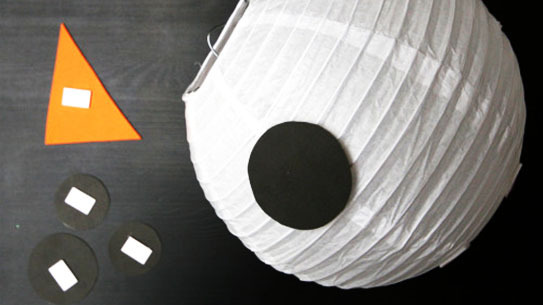 You could make your own lantern out of cardboard, but having a stable base to add decorations and a glow stick makes things a little simpler. Grab two different sized cups to trace around - a larger one for the eyes and a smaller one for the mouth. 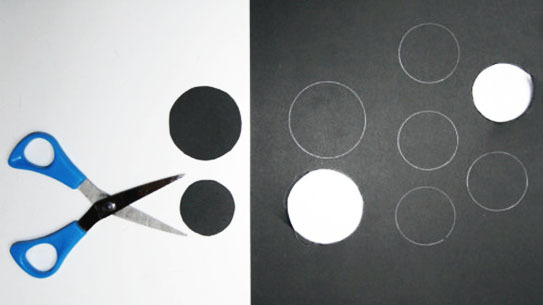 Trace two large circles for the snowman's eyes and five small circles for its mouth onto the black paper and cut them out. If you can't find some suitable small circular shapes to draw around try out lids, toilet rolls, sellotape, tins or pogs (if you have a portal to 1994). Did you know: The traditional black eyes and mouth on snowmen came from traditionally using black coal to decorate their snowmen. Next we need a snowman nose: With a real snowman, we would of course use a carrot. But for your lantern a real carrot just won't cut it. 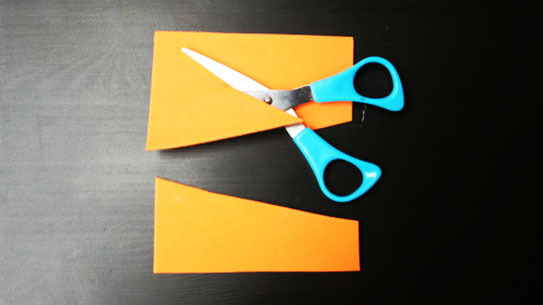 We've cut a triangle out from orange foam, which works perfectly. But you could use orange card, or even draw your own carrot and cut it out. To make all the pieces stick on the paper lantern properly, double stick tape works better than most other kind of glue. We've used double stick pads, which are excellent and very adhesive. 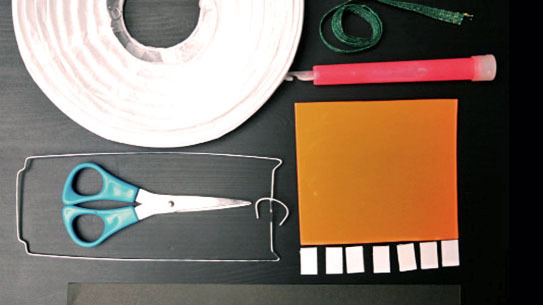 You could also cut up a roll of double stick tape. One piece should work fine for the eyes and mouth - you may want to add a bit more to the nose, depending on its size. Open the lantern and insert the metal holder. This can be a little fiddly and differs slightly lantern to lantern. This might be a better grown-up led task. You should have some instructions with your paper lantern to follow. 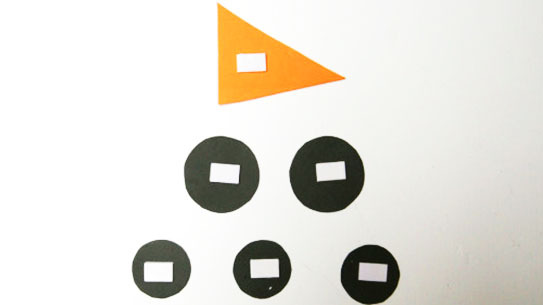 You can now stick on the pieces to make a face for your snowman lantern with two eyes, a nose and a row of black circles as the mouth. As soon as you're happy with the decoration of your snowman lantern, you can activate the glow stick and hang it in the lantern. As a glow stick is quite safe and doesn't get hot, so you can still hold the lantern and the stick and figure out how best to place it. If your glow stick doesn't have a hook, use a piece of wool or string to attach it to the inside of the lantern. If you don't have a glow stick, you can also take a battery LED tea light, which creates an awesome light with its flickering flame. Tie the string to the lantern and hang up your snowman. Then switch off the lights and watch your snowman glow! Did you know that there is a tradition in Germany that children create all kind of different lanterns in the autumn? 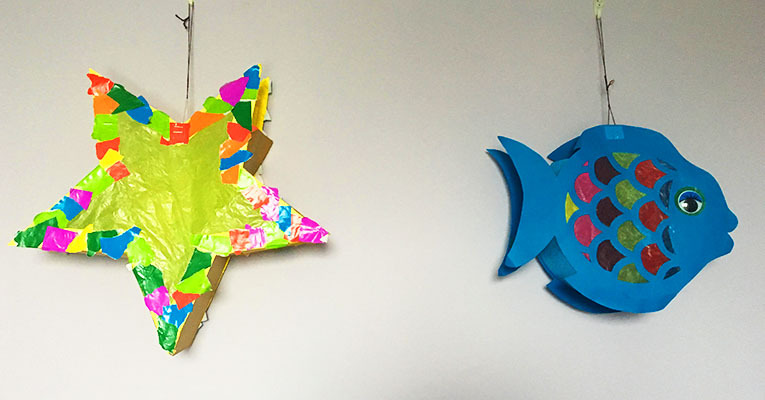 There is a big variety of ready-to-buy lanterns available but mostly the German kids want to create their own one. They start rehearsing special songs to match this lantern/autumn/St. Martins theme a couple of weeks before and get very excited about it. Then they meet with many other children from nursery, school, church or the neighbourhood to walk with their lanterns in the dark while singing the songs they have practised beforehand. In some of the bigger German lantern parades - like the one taking place beginning of November in Hyde Park in London - you can even see St. Martin leading the crowd of children and parents, riding on a real horse and dressed in traditional clothes from many centuries ago. St. Martin was a man known for riding through a dark and snowy winter night, dividing his coat with his sword into two pieces and to give away one half to a poor beggar who was sitting shivering with cold and totally lost in the snow. Without waiting for a thank you he rode away with only half of his coat left. What a generous man!